This was our first cruise on the Dawn ( been on all the others), was a bit worried as other people had reported it as a bad experience. However, I was very satisfied. 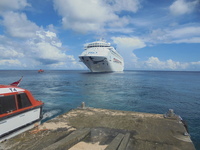 We were lucky with the weather and got ashore all ports, P&O organized some lectures on board which was very interesting. Alotau - been twice previously, there isn&apos;t really much to see there. There was two new places to go drinking - one just after leaving the dock on the left, it was a big hut with natives singing and playing instruments. Beers were $5 or 10 Kina. Keep walking and arrive in town and a new resort ( Imperial I think ), it was really good with new pool and great gardens ( it was full of Aussies) beers were $5.50 or 11 kina. Ship tours were available but most people didn&apos;t like them. Lots of beetle nut chewing and spitting everywhere, also watch out for pick pockets here. Kitava Island -Tender ashore. Very lovely place, lots of natives selling junk ( I mean interesting items). Everywhere there is schools singing and hospital etc people after your money - make sure you take some small kina with you as they have nothing and all is appreciated. Snorkelling is good especially over the small island ( 5 kina a trip- by speed boat or sailing vessel) Kiriwina Island - been once before. They put on a big dancing show and usually a cricket game ( but bus broke down so no cricket this time), people follow you everywhere wanting you to pay them small money to show you around. You need to go past the small island to find any coral alive and the shelf drop off is where the fish etc are at. 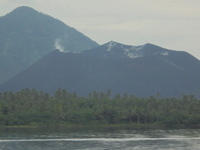 Rabaul - been once may years ago. You can just get off and get a tour ( the same company I used 3 years ago) less then half price from ship. Interesting thing I noted - the ship tours travel in convoy with a armed guard in first van and a spare empty van at the rear in case one breaks down. The tours to volcano and old war sites are interesting and now have air conditioned vans. Not much to see in town. Conflict Islands - never been - beautiful - It&apos;s owned by some rich Australian I heard. Everything is expensive beers are $10. Walk to other side of island and swim out to the coral and fish ( fair distance but it&apos;s salt water so can float most of the way ), great for coral and fish ( probably the same as the best I have seen at Mystery Island). No locals to hassle you. Cabin - Was a 4 berth but only two of us, but it was fine for size and clean. We had lots of problems ( air conditioning, cold water stopped, plug stuck in sink, noisy neighbours ) but reception got it all sorted so that was fine. Food - There is the Waterfront and Pantry for free eating, we never bothered with the Waterfront as we heard it was booked out after 1 day ? Pantry food was fine, of course it was crowded at times but you could always find a seat or stool somewhere. Dessert bar had too many cakes as usual, but did have fruit salad, but no ice cream. The Orient ( where most trivia&apos;s etc was held was very noisy from the bar and ice crushing machine going all the time. Atrium as usual had very little seats, almost impossible to get one for shows or trivia&apos;s etc. Entertainment was OK, a few fill in shows, but that&apos;s normal. Duty Free - what a joke , it should say extra duty, drinks were at least double prices in Vila. Exchange rate on the ship from Bank was $1 = 2 kina. Entertainment team were OK, Cruise director Ben was a very bubbly person and always said hello to you, seemed a really nice guy. Unable to walk all the way around the deck 7 only up and down each side. Get to gym early ( it says opens at 6:30am, but it was always open at 6am. Beers on board ranged from $6 up and wine was $9.50 up per glass. No tender tickets were used on this cruise, just line up early. Laundry was 3 x $1 coins for washing, we just hung up our clothes in room to dry. 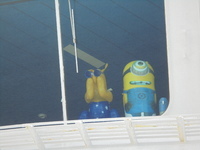 Overall it was a great cruise, especially as we met such lovely people on board ( mostly from Brisbane of course ). Prices for cruises out of Brisbane are more expensive then out of Sydney. Brisbane to PNG (5 ports) and return. This was our first cruise on the Dawn ( been on all the others), was a bit worried as other people had reported it as a bad experience. However, I was very satisfied. 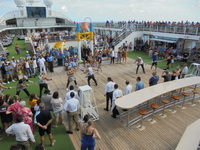 We were lucky with the weather and got ashore all ports, P&O organized some lectures on board which was very interesting. Alotau - been twice previously, there isn&apos;t really much to see there. There was two new places to go drinking - one just after leaving the dock on the left, it was a big hut with natives singing and playing instruments. Beers were $5 or 10 Kina. Keep walking and arrive in town and a new resort ( Imperial I think ), it was really good with new pool and great gardens ( it was full of Aussies) beers were $5.50 or 11 kina. Ship tours were available but most people didn&apos;t like them. Lots of beetle nut chewing and spitting everywhere, also watch out for pick pockets here. Kiriwina Island - been once before. They put on a big dancing show and usually a cricket game ( but bus broke down so no cricket this time), people follow you everywhere wanting you to pay them small money to show you around. You need to go past the small island to find any coral alive and the shelf drop off is where the fish etc are at. 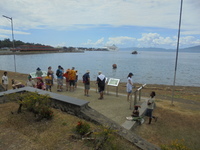 Rabaul - been once may years ago. You can just get off and get a tour ( the same company I used 3 years ago) less then half price from ship. Interesting thing I noted - the ship tours travel in convoy with a armed guard in first van and a spare empty van at the rear in case one breaks down. The tours to volcano and old war sites are interesting and now have air conditioned vans. Not much to see in town. Conflict Islands - never been - beautiful - It&apos;s owned by some rich Australian I heard. Everything is expensive beers are $10. Walk to other side of island and swim out to the coral and fish ( fair distance but it&apos;s salt water so can float most of the way ), great for coral and fish ( probably the same as the best I have seen at Mystery Island). No locals to hassle you. Cabin - Was a 4 berth but only two of us, but it was fine for size and clean. We had lots of problems ( air conditioning, cold water stopped, plug stuck in sink, noisy neighbours ) but reception got it all sorted so that was fine. Food - There is the Waterfront and Pantry for free eating, we never bothered with the Waterfront as we heard it was booked out after 1 day ? Pantry food was fine, of course it was crowded at times but you could always find a seat or stool somewhere. Dessert bar had too many cakes as usual, but did have fruit salad, but no ice cream. The Orient ( where most trivia&apos;s etc was held was very noisy from the bar and ice crushing machine going all the time. Atrium as usual had very little seats, almost impossible to get one for shows or trivia&apos;s etc. Entertainment was OK, a few fill in shows, but that&apos;s normal. Duty Free - what a joke , it should say extra duty, drinks were at least double prices in Vila. Exchange rate on the ship from Bank was $1 = 2 kina. Entertainment team were OK, Cruise director Ben was a very bubbly person and always said hello to you, seemed a really nice guy. Unable to walk all the way around the deck 7 only up and down each side. Get to gym early ( it says opens at 6:30am, but it was always open at 6am. Beers on board ranged from $6 up and wine was $9.50 up per glass. No tender tickets were used on this cruise, just line up early. Laundry was 3 x $1 coins for washing, we just hung up our clothes in room to dry. 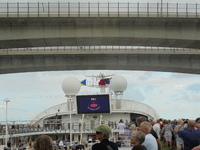 Overall it was a great cruise, especially as we met such lovely people on board ( mostly from Brisbane of course ). Prices for cruises out of Brisbane are more expensive then out of Sydney.